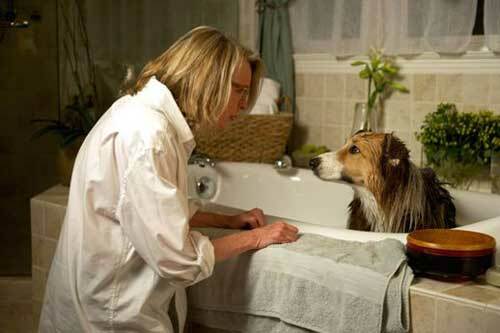 You gotta love a good dog movie, and Darling Companion has not only a cute dog, but also a helluva cast. Diane Keaton (Morning Glory) leads the charge as Beth, who’s struggling with a self-involved husband (Kevin Kline, No Strings Attached) and an empty nest. After she saves a bedraggled dog lost dog from the side of a freeway, Beth forms a bond with the animal. But when Kline’s Joseph loses the dog after a wedding at their vacation home in the Rockies, a distraught Beth gets help from the remaining guests and a mysterious young woman (Ayelet Zurer, Man of Steel) for the search. Along the way, the searchers are affected by the adventure, which takes them in unexpected directions. Dianne Wiest (Rabbit Hole), Richard Jenkins (Let Me In), Elisabeth Moss (TV’s Mad Men), Mark Duplass (Greenberg) and Lindsay Sloane (Horrible Bosses) also star in the PG-13-rated film. The first film in years from director Lawrence Kasdan (French Kiss), Darling Companion was screened in a limited number of theaters, to pretty poor reviews from critics and mixed reviews from moviegoers. Critics’ biggest complaints were with the script, which Kasdan co-wrote with his wife, Meg Kasdan (Grand Canyon).